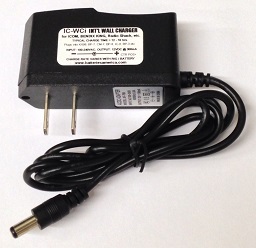 IC-WCi : Worldwide Wall Charger for ICOM, Radio Shack, Bendix King batteries. Plugs into 100-240VAC wall outlets. Output: 12VDC @ 300mAh, barrel plug, center Positive. Plugs into batteries such as ICOM BP-7, CM-7, IC-8 (case), BP-8, CM-8, BP-3; Plugs into radios such as ICOM IC-A20, IC-A21, IC-02AT thru 04AT, etc; Radio Shack HTX-202; Bendix King KX99. Exclusive item - order ONLINE from BATTERIES AMERICA !